I was quite shocked when I heard the news that TOTP (Top of the Pops) is to close down after 42 years and some 2100 episodes. Is this the first of many major ‘heritage’ media brands that are just becoming irrelevant in today’s easy find, on-demand and share with everyone emerging media landscape? Will many major brands simply not be able to turn back time? Top of the Pops – (perhaps paraphrased to ‘best examples of contemporary pop music’) has simply become irrelevant. It appeared to many of its audience as a live performance but, and I hope not to spoil the fantasy, it was never live in the last 10 years or so – I was close to the varying degrees of miming that took place on a pre-record a day before. No TOTP was nearer to a talent show than an up-to date place to really find out about new music. A weekly batch of eight songs selected by a couple of ‘programmers’ prior to a Monday morning production meeting was never going to survive in a world of twenty 24/7 digital music channels, peer-to-peer sharing and the likes of iTunes/iPod. No in the music long tail, a weekly sheduled programme that shows a handful of some of the music at the head of the tail would only survive if it had something truly live or unique. The TOTP enhanced version, got a a few special XMas airings in a cut down form, but more importantly as a pilot was responsible along with a Wimbledon pilot, for convincing the BBC to do interactive broadcast media. In the pilot, we wanted to explore in one of the many features, a range of ‘extras’ such as those rare backstage glimpses that at least appealed to the ‘goss’ in all of us. But that was not enough. Neither was the ability to sing along in karaoke mode or a link to the video for those who were never keen on the staged ‘screaming kids’ pre-record. 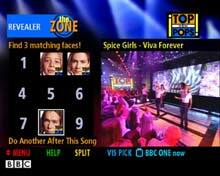 One thing I put in the pilot interactive TV version that never made it to the tx versions may have been its saviour (if there was a continous presence on 24/7 digital TV) and that was the web 2.0 elements. Alongside all the ‘insight’ information about the acts I was insistant on including in the pilot community areas that included simple casual games, emails, chat, voting and instant messages from viewers and forums around the show (see the images attached). But most big broadcasters are simply not very good at this sort of stuff, and chicken out, often with excuses of it being too difficult to moderate, or fall back on the technically too expensive excuse (I know we did) – so best leave that to the millions using free, easy to use, open source web 2.0 publishing software then – geez and we wonder why audiences are on a broadcaster exodus. 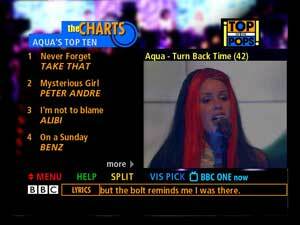 But back to TOTP I really believe that the brand should have been given a chance and rather than a half hearted attempt at the eTV version around XMas specials, a TV 2.0 version would have allowed this particular icon to jump the chasm created by the latest tsunami sized digital wave. But that will never happen and the BBC Worldwide, commercial website, or the weaker bbc.co.uk version, may continue for a while until the brand itself fizzles out in the next few years. The editorial stance that TOTP had that is now seen as an irrelevant voice to the music youth in the UK must shock other large media brands who believe their editorial team are truly representing what audiences want to consume. I even fear for MTV and those other 24/7 music loop channels who will be very soon relegated to ambient background or occasional party channels as the audience simply shifts to on-demand, shared playlists and only really trusts a global ‘collective recommendation’ system. An individual simply has their own personalized Top of the Pops, which incidentally changes moment to moment. No the editorial winners in the future are not teams sat inside boards rooms, those existing ‘heritage’ aggregators of content (magazines, broadcasters, film studios, newspapers) they will simply be a ‘wisdom of the crowds’ range of trusted filters. An avid music fan in Wisconsin becomes as important as the programmers at MTV or BBC – music will be found by searching for groups of trusted like-minded ‘browsers’ – Top of the Pops becomes Top of the Aggregators. To put a slightly different slant on it, the distribution channel is now irrelevant for most media consumers, they can get their content in many ways, no now the important thing is trusted sources of links to content. YouTube and GoogleVideo will of course do the same to TV programming over the next few years that MP3 (etc) did to the music industry and TV music programming. The only TV programmes that will survive will not be the ones who simply plop their content a day earlier on iTunes but ones that differentiate themselves from the masses – those who build brand across multiple platforms and more importantly create a web 2.0 blanket around it. If viewers cannot resonate with the content they simply forward it and forget about it. Those brands that do have the ability to receive and incorporate audience content (and not of the “home video show” type – I hate it when some TV folk tell me that is already happening!) – but allow them to offer content and weave it into the fabric of the offering, which becomes effectively what TV magazine programmes used to be – a collection of what people like to see in one package. That will be far more important than anything sixty people, a well equipped six camera shoot studio and the record business can come up with.